Take a break from our full-size mainstage productions (like our upcoming production of CHARLOTTE’S WEB, playing January 25 through February 9) and join us “on the terrazzo” in our lobby for the second installment in our new “Roxy Reads” Series. This is the perfect opportunity to sit back and listen to what makes great plays work: the words! 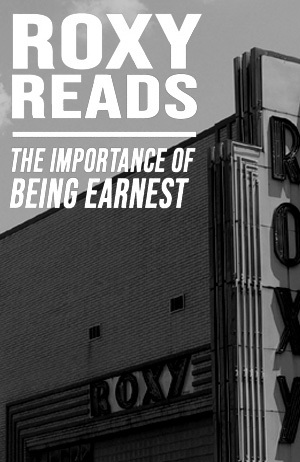 Next in our reader’s theatre series is Oscar Wilde’s comedy of manners, THE IMPORTANCE OF BEING EARNEST, on Wednesday, January 23 @ 7:00pm. In Wilde’s most brilliant tour de force, two clever young bachelors each craft elaborate double lives to avoid the social obligations they find so cumbersome. Through a series of lies that happen to be truths, and truths that happen to be lies, couples are engaged, loves are forbidden, and long lost identities revealed. Readers include professional company members Brian Best, Ryan Bowie, Brooke Leigh Davis, Ian Alexander Erbe, Matt Flocco, David Graham, Emma Jordan and Bryan Plummer … and who knows? You may even be asked to read a role! Enjoy tea and crumpets, and stick around after the reading for a talkback with our company of actors. We will discuss your thoughts, impressions and analyses of the work, and our professional company will weigh in with their opinions. Oscar Wilde’s THE IMPORTANCE OF BEING EARNEST is being presented “on the terrazzo” in our lobby area. Seating is general admission. Tickets are $15 and may be reserved online via the below button, by phone at (931) 645-7699, or at the theatre during regular box office hours (9:00am to 2:00pm, Monday through Friday, and one hour prior to curtain).